Eclectic Paperie: Compendium of Curiosities Challenge Begins! Compendium of Curiosities Challenge Begins! Please visit Studio L3 to see what awesome challenge Linda Ledbetter is hosting. 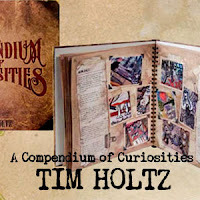 You'll want to get out your copy of the new Tim Holtz book, Compendium of Curiosities and let your creative juice flow. This is the first week so be sure to check out what fun awaits you this week. Some kind of wonderful new things have arrived!